On a very hot sunny day, an ant was very thirsty. It went to a pond to drink water. The poor ant lost its balance when drinking the water and it fell inside the water. A dove was watching all this from a nearby tree. The ant was struggling for life in the water. The dove felt very sad for the little ant. It plucked a leaf from that tree and dropped it into the pond. The leaf fell near the ant. 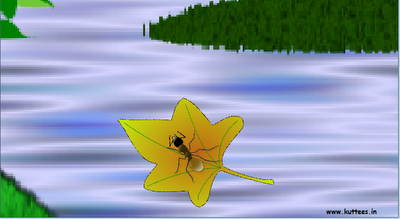 The ant got over the leaf and then reached the shore. 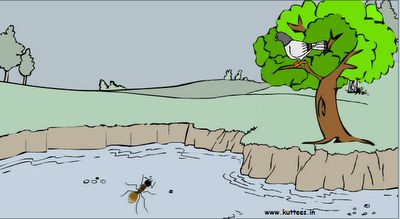 The ant thanked the dove for his kind help. 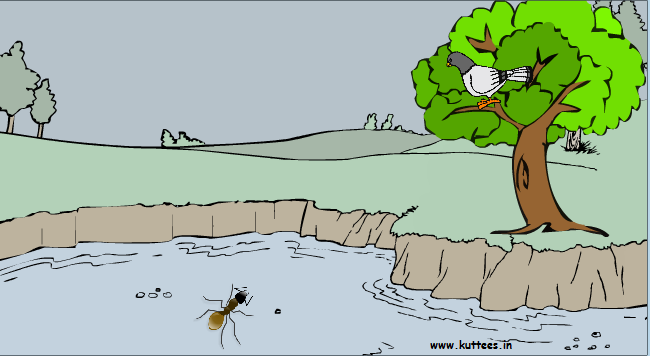 Days passed by, after few months when the ant was going near the pond, he saw a bad hunter with a gun. The hunter was targeting at the dove sitting on a branch in the tree. The dove didn't know about the hunter. Just when the hunter was about to shoot the dove, the little ant got over his leg and bit him. 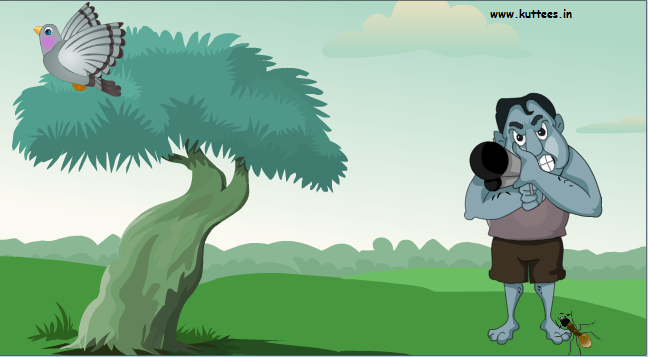 The hunter shouted in pain and also missed his focus. Hearing this loud sound, dove realized the danger he was about to face. The dove flew away from the tree and escaped. Later he thanked the ant for the help. MORAL : Every good deed we do for others will surely come back to us.